So you have booked that low fare flight a hotel and your itinerary is all set, all you need to do now is pack your things for that much awaited vacation. I used to be panicky when it comes to packing things up. I would pack loads of clothes and accessories that are meant for events that could possibly happen.... up there in my head. Oh yeah I pack like crazy whenever I go out of town, Until I had a life changing experience came to me. I started to be more carefree and adventurous but not to a point of irresponsibility. Since then I was able to make a formula on how to make my checklist. Let me share them to you. Research on the weather of the place that you are going to whether it is out of the country or domestic. Places may have extreme weather conditions like if you are near a dessert where it gets really hot during the day and extremely cold at night. Domestic destinations isn't an exemption to this, just think of Batanes where you could experience mild winter or the Cagayan region where it gets really hot. It would really help you make your checklist if you write down what are the activities that you are scheduled to do during your trip. From this list you can now make your checklist of things to pack by listing down what are the things that you would be needing. List all essentials first like your tooth brush, deodorant shampoo and soap you wouldn't want to share on someone else's stuff right? And remember the activity list that you made? list down the what clothes you would want to wear on these activities. I only bring two extra shirt and a pair of pants since I wear shorts most of the time whenever I travel. For footwear if I am travelling via air I wear flip flops or slip-ons. I would refer to my activity list before I'd bring a rubber shoes. If one of my activities would require a lot of running and walking I'd definitely bring one. Jacket - I always bring a jacket. If you know how to properly use your jacket it can serve you so much more than just warming you up. I use my jacket to protect me also from the sun and rain by putting it over me. But more often, I use it as a blanket when I sleep on long trips in air conditioned buses. These are are the basic things that I keep in mind whenever I pack my things. I try to make sure that I only bring one backpack for everything that I need. Packing tip bonus: when packing your clothes don't put them in your bag the same way that you would when you are folding them for your closet. 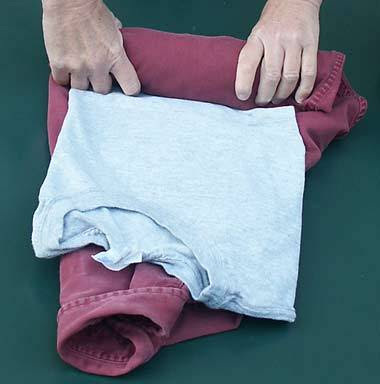 Roll your clothes so that they may take up lesser and more compact space. It will also lessen the possibility of your clothes getting more wrinkles. So what is your packing secret? I'm not OC in packing. I just stuff 'em all in my suitcase and - pak! - keep my fingers crossed I'd find everything when I arrive. My only tip: use disposable undies when traveling. Wear and throw away - very convenient, and you leave your essence in the places you've been. Hehe. And I make sure I have 'em in my hand-carry in case the airline loses your luggage! about disposable undies.... hmmmmm i have yet to try it.... comfy naman cia? Medyo weird ang feeling at first pero you'll get the hang of it (pun intended, haha). And they pack well. As in fold mo lang ng maraming beses, puede na. Thanks for these tips brod! Weakness ko talaga ang packing whenever I travel. I tend to bring more things that I actually need.hehehe.